The New York Times bestselling author of Prime Cut serves up another tantalizing tale of culinary mystery and suspense, as chef turned sleuth Goldy Schulz goes on live television to prepare a meal to die for...but discovers that murder is already on the menu. When Goldy Schulz is offered a temporary stint hosting a cooking show for PBS, she jumps at the chance. After all, she could use the money, not to mention the great exposure. Her catering business is in shambles, and publicizing her new venture as a personal chef will help get her back on track. Plus taping the shows at Colorado's posh Killdeer Ski Resort will be fun. A little cooking, a little chitchat. What could go wrong? The question Goldy should have asked is, what wouldn't go wrong, especially when she has to drive through a blizzard to do one of her shows live for a PBS telethon. To make matters worse, Goldy has an unpleasant duty to perform right after the show. She and her policeman husband, Tom, have agreed to sell a piece of Tom's treasured war memorabilia to help ease their financial woes. The buyer: Doug Portman, art critic, law enforcement wannabe--and, to her eternal embarrassment, Goldy's ex-boyfriend. Predictably, the live broadcast is riddled with culinary catastrophes, from the Chesapeake Crabcakes right down to the Ice-Capped Ginger Snaps. But the deadliest dish of all comes after the cameras go off, when an unexplainable skiing accident claims Doug Portman's life, and Goldy is the one who finds his crumpled body on the slopes. Even more shocking is what police find tucked away in Doug's BMW: a greeting card with a potentially deadly chemical inside. As the police try to determine if Doug's accident was really foul play, Goldy does a little investigating of her own, but finds more questions than answers. Was Doug, chairman of the state Parole Board, accepting bribes from potential parolees? Was he connected to the ex-con who's been telling Killdeer skiers that he's planning to poison a cop? And how did Goldy and Tom get mixed up in this mess? Winter sports can be dangerous, but can they also be deadly? "Cooking at the Top!," Goldy's new TV show, is broadcast from one of Colorado's poshest ski areas. Unfortunately, she finds whipping up delicacies at 11,000 feet as perilous as skiing steep runs. Then a telethon raising money for the widow of a tracker killed mysteriously ends in disaster. 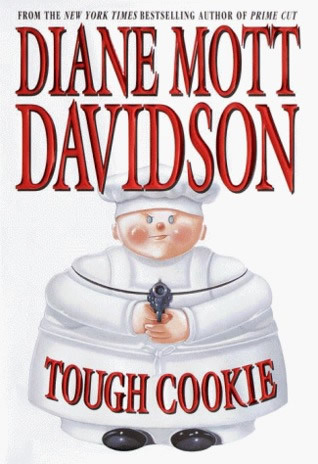 Goldy finds herself searching the icy slopes to find a killer with desperate secrets to hide but this may be one time the tough-cookie caterer will not be able to schuss to safety! Included are Goldy's original recipes for mouthwatering Sonora Chicken Strudel, incomparable Marmalade Mogul Muffins, and sinfully sumptuous Chocolate Coma Cookies. "This is hearty fare for those who like their murder with a bit of nosh on the side."